Even though the water is still running high around 4500 cfs a few of the fish have started looking for the big bugs. I have seen ants, beatles, hoppers, and cicadas on the water this week. While not in big number it is enough to peak the interest of some nice fish. I have been fishing the Green forever as far as my life is concerned. Some of my earliest memories in life have to do with fishing and this river in particular. I grew up fishing with my dad and it has given us a bond for life. I think that fishing is a great way to build relationships. It may be between friends, family, or business associates. For some reason fly fishing seems to bring perspective to peoples lives and what is really important in life. For most, fly fishing is not about the fish or the catching at all. It's about getting out and have a good time with others. It is a chance to get away. I enjoy fishing with a lot of father son combo's and even the occasional father daughter combo. It is great to see the fun and excitement shared by those who love and care about each other. Fishing is a valuable time and serves more purpose than most people realize. It's not the fish that we are all after, it's the experience. Experiences are always more fun when they are shared. So get out and enjoy the outdoors and remember to take someone with you. With the recent temperatures, this september hardly feels like fall. As October begins, this fish reminds me of how many big fish have been caught in my boat during this time of year. In the last three years I have had one of the two biggest fish of the year caught in the last week of September or first week of October. These fish have all come on the B section. While fishing has not been at its best the last couple of weeks, I have found some nice fish on the "B". This fish was 21 1/2 inches, the second biggest of the year. While fishing can be a little slower right now, be persistent, you might just catch a Green River trophy. With spring almost upon us I thought I would put up a few pics to help get into the mood. 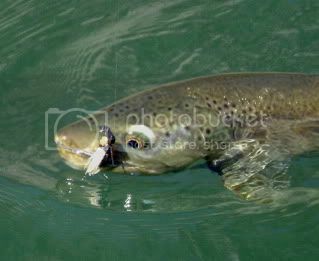 The first thing most people think of about November fly fishing on the Green is big, colorful, aggressive, brown trout. 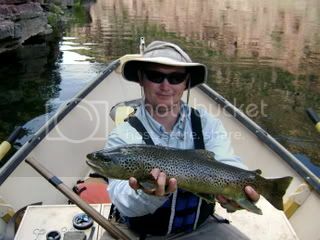 Fall bring a lot of colors to the mountains and brown trout are no exception. Gold, yellow and reds will be vibrant on the fish at this time of year. It was commented yesterday that these are the prettiest browns in the world. I think I would have to agree. Perhaps my favorite way to fly fish is to throw streamers. When the browns are getting ready to spawn they become aggressive and a streamer can be the ticket to catch a ride with one of the bigger browns in the river. Many of the bigger browns will be resting in back eddies before they spawn. You don't want to over look these spots as you are fishing. The later in November it gets, the more fish you will find on spawning reds. While there are differing opinions on fishing fish while they are on the red I am not going to express mine. The reds can be a easy place to catch fish, especially for a beginner. You can often find big fish on reds especially if you don't spook the fish. Many people walk on the reds or simply right up to a red assuming the fish won't spook while they are spawning. While many of the fish won't spook, I have observed that the bigger fish will spook. Take your time and look for a big one. If you sneek up on a big fish, you might have a shot at catching him. You can even find a few risers in November. There are a few midges out in the mornings and the occasional BWO's in the afternoon. In good terrestrial years such as this one, you can still catch fish during sunny afternoons. This is one of my favorite times of the year. The crowds are gone during the week and there is a better chance to find big fish. Here in Flaming Gorge country it's the time of year when the men of orange show up. No, were not at a Tennessee football game, but there is enough orange to fill the stands. Big game hunting has arrived. We welcome our hunting friends as many of them are flyfishermen and all around outdoor lovers. The archery elk and deer hunts have come and gone with success. Local hunting expert Kevin Clegg is featured here with a large bull shot on the first day of his hunt. While Flaming Gorge is known for great fishing, it has great hunting as well. The Three Corners area north of the river and east of the lake holds some trophy elk, as well as many bucks, and some moose (this is a draw area). Flaming Gorge and the Green River are known for trophies as well. Trophy trout that is. Flaming Gorge holds the state record for Lake trout (51 lbs. 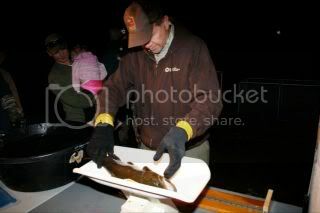 ), Brown trout (33 lbs. ), and Rainbow trout (26 lbs.). The river isn't far behind behind with 25 and 29 lbs Brown's having been caught. Whether your here for the trophy big game, trout, or both, enjoy the outdoors and be safe!! !